The DPTechnics analog CAN-bus module is a very high module with 8 independant analog input channels and 8 independant analog output channels. Every channel can handle everything between [-10V, 10V] and [0mA, 24mA] at 16-bits precision. This extra-ordinary precision is realized through careful hardware design and some clever module firmware. Every I/O port is therefore rock-solid and it's even possible to process incoming analog data on the embedded ARM processor. The module has 8 inputs and 8 outputs which are completely independant of each other. 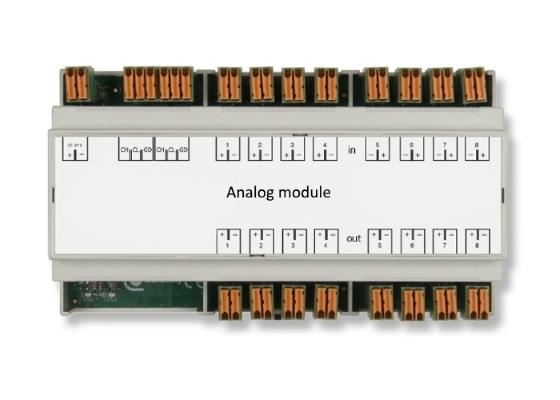 To lower costs in your application it is possible to order the analog module without the output drivers on the PCB when you order more than 25 pieces. The module has an internal ARM Cortex-M0 processor which runs at 48MHz. CAN-bus messages are processed quickly and there is room for custom application code if required. The module is tested and CE certified for both home and industrial use. You can thus use it in industrial applications without having to worry about interference. The power supply voltage is between 12V and 24V, common for industrial use.